How do you convince home-owners to pay you to install solar panels on their roof tops? Even though solar is one of the biggest buzz words this year, it’s still tough. While we often discuss the market dynamics of silicon supplies, panel manufacturing and installation costs, we spend a lot less time on customer adoption. But the fact is for every on-site evaluation a solar installer does, Sungevity President Danny Kennedy estimates only 10 percent actually sign up for panels. Not such good odds. So what are solar installers doing to get more potential customers aware of their offers? Below are a few different approaches solar installers are taking in their marketing. Take a look and let us know what you think. Sun Run, a residential solar financier, has teamed up with folks behind the public television show Hippy Gourmet to create a short video pitch explaining why power purchase agreements are the hassle-free way to go solar. While founder and COO Nat Kreamer doesn’t get into the nitty-gritty of electricity rates, he does a nice show-and-tell of how residential solar provides power to your home. Sungevity, the Berkeley, Calif.-based startup that uses satellite imaging to size a solar system for your roof, gets points for adding a personal touch with a handwritten note. A few weeks after entering my home address information to get a solar panel estimate I received this snail-mail note (seen below) thanking me for my interest and pointedly asking me if I had received the iQuote email they’d sent me. It’s a nice touch, but also pretty generic. 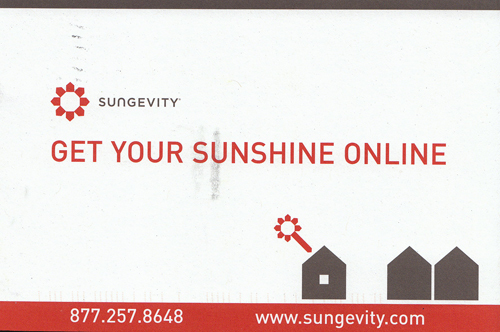 More intriguing, and potentially creepy, is the marketing idea Sungevity President Danny Kennedy told us about that connects Sungevity’s satellite technology with direct marketing. The company could size up and calculate the design and cost of a solar array for an address, put that info, with a picture of that roof, onto a postcard and send it to that address. This idea was tested when Reason Magazine put satellite photos of each subscriber’s home on the cover in an article on privacy back in 2004. Akeena had been planning a large media blitz with the anticipated passage of San Francisco’s solar incentive rebate program. Unfortunately, that program is still hanging in legislative limbo, but Akeena had already printed up thousands of doorhangers promoting those rebates. This is also a hard-and-fast example of how regulatory uncertainly is wreaking havoc on cleantech businesses’ ability to plan not only in the long term, but on a month to month basis. Solar panel marketing needs to make them “Patriotically”, “Socially”, “Politically” and correct. What is needed is a mass advertising campaign at all levels: posters, billboards, bumper stickers, magazine ads, TV and radio commercials. Not for brand A or brand B panels but just generic, spinning the purchase of a solar panel as being an act of patriotism while portraying coal, oil and nuclear power as being UNpatriotic. Use the simple patriotism play. It worked for President Bush selling even things as unpopular as wire tapping. These prices are really good for residential solar. Innovative financing models and incentives will only make grid-tied systems a reality for more people around the world. I hope you all will consider adding your name to the Global Solar Count (http://www.globalsolarcount.org/). A point of interest: our smallest Sungevity system (1.4 kW STC) without the SF program is $7,500 (net cost after rebates and tax breaks) and covers, for an average SF home, about 1/3 of the energy use and results in about $14,000 of savings over the 25 year life of the system. That’s making a home a hybrid! With the SF program, that system cost could drop $3,000-$4,000 dollars so an SF resident could get an installed system for $3,500: saving 4 times that in reduced electricity bills. Sorry for all the serious numbers but our hope is that this makes solar more accessible to more SF residents. In the time since our April 22 launch, our systems sold to date in the Bay Area will (over their lifetime) remove about 1,500 tons of CO2 – the equivalent of driving an average American car around the world 390 times and saving homeowners hundreds of thousands of dollars. We think that’s awesome progress. I don’t think this is a marketing problem. It’s a price problem. Even at $9K, that’s out of most people’s reach. Companies could and should rethink the entire offering. For another take on this… See here..